Why, to Beltway reporters, Glenn Greenwald is no Bob Woodward. Every so often, a single event so galvanizes members of the mainstream media that they end up revealing things about themselves that tend to be obscured by their typical, surface-level coverage. 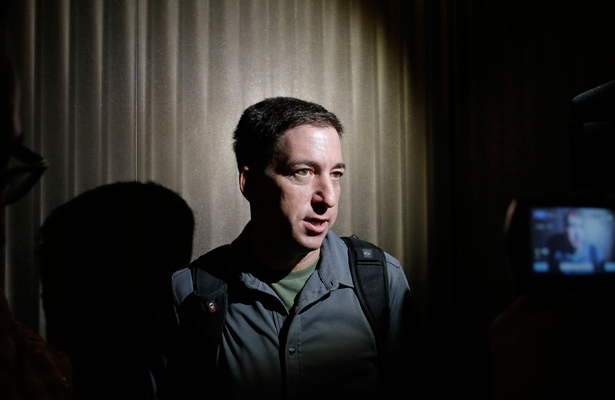 The Glenn Greenwald/Edward Snowden NSA bombshell is one such story. Among its important contributions, it demonstrates just how deeply the most prominent members of the MSM identify with the powerful officials they profess to hold accountable, rather than the public they are supposed to inform. Consider this: Greenwald’s “crime,” to the best of Gregory’s (or anyone else’s) knowledge, was reporting leaks of classified national security material, something that it would not be an exaggeration to say happens almost every day in Washington (and is nearly unavoidable, given our classification system’s ridiculous excess). When Bob Woodward published his hagiographic Bush at War in 2002, the reporter explained that he was given access to the deeply classified minutes of National Security Council meetings, among myriad other secret decisions and intelligence data. This shocked even Woodward, who observed, “Certainly Richard Nixon would not have allowed reporters to question him like that. Bush’s father wouldn’t allow it. Clinton wouldn’t allow it.” Did anyone in Washington suggest that Bob Woodward should be charged with a crime? Reporters in these same higher media precincts have also engaged in a rash of irresponsible speculation. For instance, NBC News reporter Chuck Todd wondered, sans evidence, whether “Glenn Greenwald, you know—how much was he involved in the plot? It’s one thing as a source, but what, what was his role—did he have a role beyond simply being a receiver of this information?” Jane Perlez and Keith Bradsher of The New York Times reported: “Two Western intelligence experts, who worked for major government spy agencies, said that they believed that the Chinese government had managed to drain the contents of the four laptops that Mr. Snowden said he brought to Hong Kong, and that he said were with him during his stay at a Hong Kong hotel”—a notion that would strengthen suspicions of alleged “espionage.” No knowledge, no evidence and no names were offered. Soon enough, this story was being repeated pretty much everywhere. sourcing—tends to be with the intelligence community (which is one reason he was able to resist the lies coming from Cheney, Rumsfeld et al.). Here again, one can see how easily the rules of good journalism are bent when it comes to figures outside the Beltway’s sacred circle. Edward Snowden, like Bradley Manning, broke the law and did so knowing he would likely be punished. But the inhumane treatment of Manning and the phony espionage charges against Snowden say more about our permanent government’s fear of exposure than about the “crimes” each man has committed. Think there's no upside to aiding and abetting mass murder? Alterman sees it otherwise for the Reagan-era officials who enabled the Guatemalan genocide.